“A network model for the evolution of terrestrial connections in Central Italy (1175/1150-500 BC ca)” by Luce Prignano, Francesca Fulminante, Sergi Lozano, Ignacio Morer will be present at Session 17 “The Road Not Taken: modelling approaches to transport on local and regional scales”. Organisers: Mark Groenhuijzen, Philip Verhagen. This session takes place on Wednesday, 30 March 2016. Visit CAA website for schedules or visit our time line. “Wine trade from Roman Crete: onomastic-geographic network analysis” by Ignacio Morer, José Remesal, Albert Diaz-Guilera, Luce Prignano, Daniel Martin Arroyo will be present at Session 16 “Networking the past: Towards best practice in archaeological network science”. Organisers: Tom Brughmans, Daniel Weidele. This session takes place on Friday, 1 April 2016. 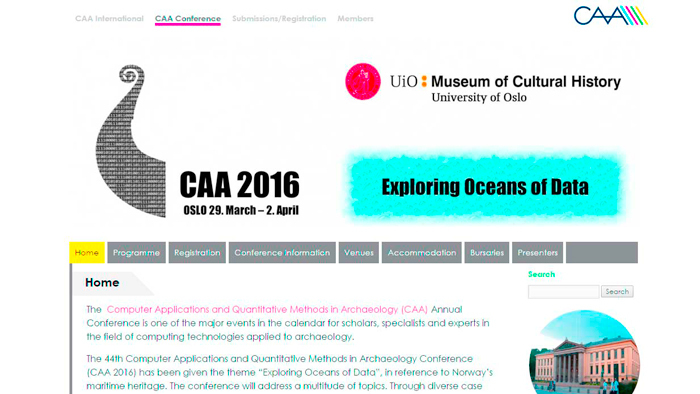 Visit CAA website for schedules or visit our time line.